Mizuma Art Gallery is pleased to announce the solo exhibition of MORI Junichi “tetany”, opening on Wednesday 3rd December 2014. MORI Junichi left a vivid impression with his three-faced cadaver trinity statue during his “trinitite” exhibition in 2011. Carved to the point where form is pushed to the brink of disappearance, the lingering presence of the missing wood chips drifting toward the inside, it was draped in the invisible traces of extinct moments. In this exhibition, the artist presents a human-shaped (hitogata) piece for the first time. Mori speaks about the making of the human form in a magazine interview published in 2006. The representation of the human shape is the most typical motif of sculpture, breathing eternal life in the human envelope. However for Mori who was born in Nagasaki and grew up listening to the stories of the atomic bomb, human beings are ephemeral existences. We might say this sense of incongruity and guilt held back the creation of this human form for a long time. Eight years later, society has changed a lot. Through his own transformation over the years, Mori eventually reached a point where he felt ready start sculpting this human piece. 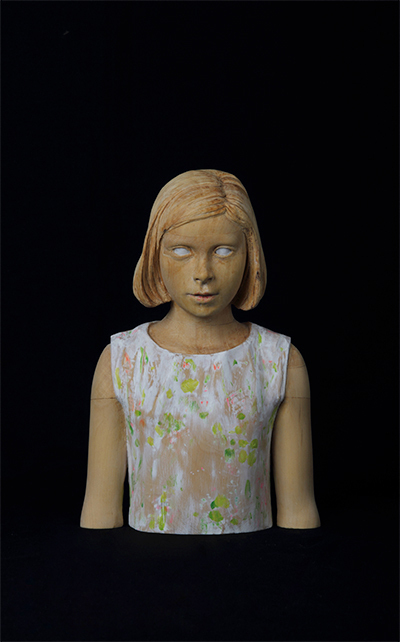 The exhibition is composed of selected memories: the painting of a girl by a certain painter, the cast of a TV drama taking place in the America of the Sixties, the words of a philosopher, photographs in a book, images and pieces of information; all transfigured into statues and paintings. If the previous show “trinitite” was about the sacred, this one “tetany” probably has its focus on the mundane. “tetany” is a medical term describing the state of contraction induced by over stimulation of the nerves and muscles, bending fingers of the hands and feet. This word was chosen by the artist to unite the different pieces otherwise apparently disconnected. We invite you to rove through the meanders of the artist’s consciousness, to experience the heaviness and lightness of time gone forever, the sacred and the mundane, the norm and abnormality; all crossing and competing against each other, echoing between the pieces.